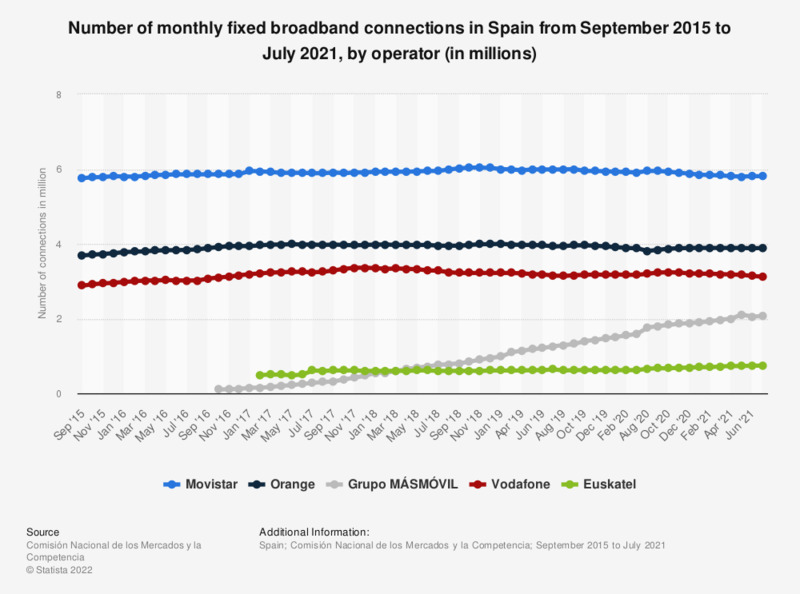 This statistic shows the monthly figures of fixed broadband connections in Spain by operator between September 2015 and January 2018. During this period, Movistar led the market with over 5.9 million connections in January 2018. To access the data follow: Datos mensuales -> Banda ancha fija minorista -> Datos por operador -> Por operador. Vodafone data includes those of Ono and Orange data includes those of Jazztel. Grupo MÁSMÓVIL includes the data of Mas Móvil, Yoigo and Pepephone since October 2016, and as of January 2017 also includes those of Xtra Telecom.